Native to Europe, western Asia, the Caucasus, and Morocco. Introduced and naturalized in North America. Pale pink to pinkish-white, turning dark pink to almost red. 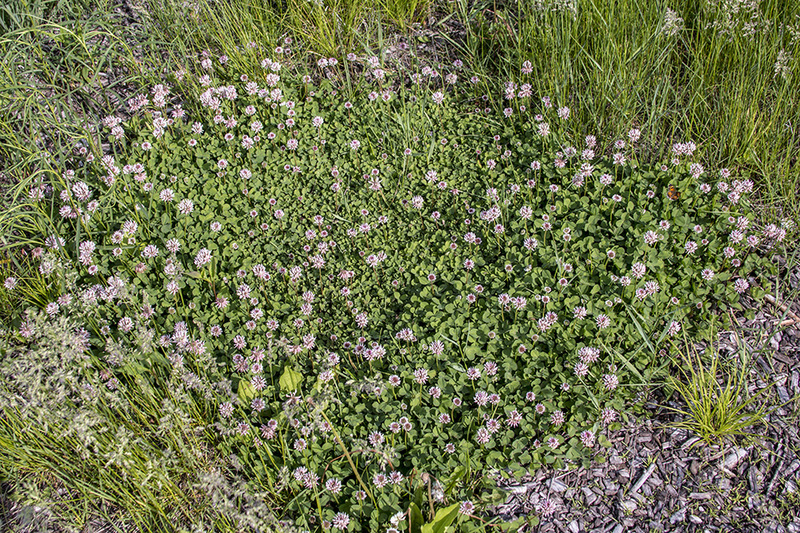 This is an creeping, perennial forb that rises on multiple stems from a taproot. The stems are light green and hairless or nearly hairless. They tend to fall over with age, usually from rain or wind, but do not root at the nodes. The leaves are alternate and compound, divided into 3 leaflets. They are on long, hairless leaf stalks. The leaflets are elliptical, hairless, and ⅜″ to ¾″ long and wide. They have no markings on the upper surface and are not notched or pointed at the tip. The margins are finely-toothed. The inflorescence is several globular, head-like clusters borne on hairless stalks rising from the upper leaf axils. 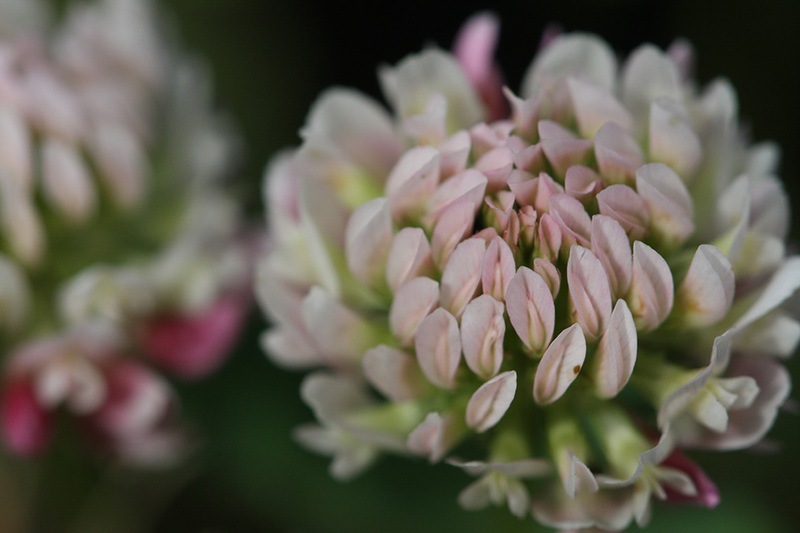 The flower heads are ½″ to ¾″ across. Each head has up to 50 flowers. 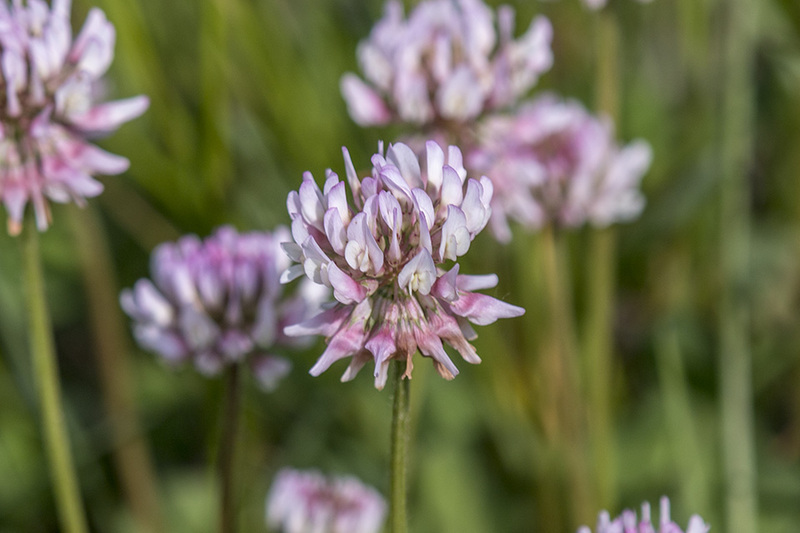 The flowers are pea-like, with 5 petals organized into a banner, 2 wings, and a keel formed by two petals fused together at the tip. Each individual flower is borne on a short stalk. 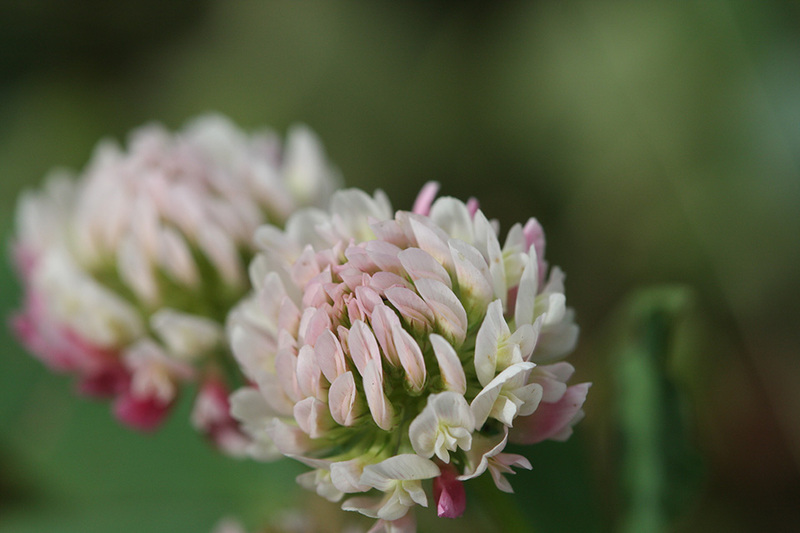 The petals are white or pale pink to pinkish-white. They gradually turn darker pink as they mature. Later they turn brown. The fruit is a seed pod. 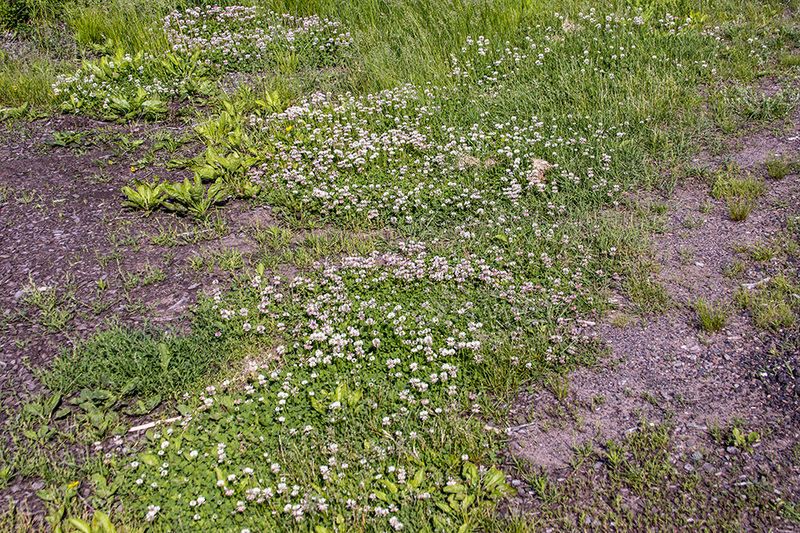 Crimson clover (Trifolium incarnatum) stems are densely hairy. The petals are crimson red. 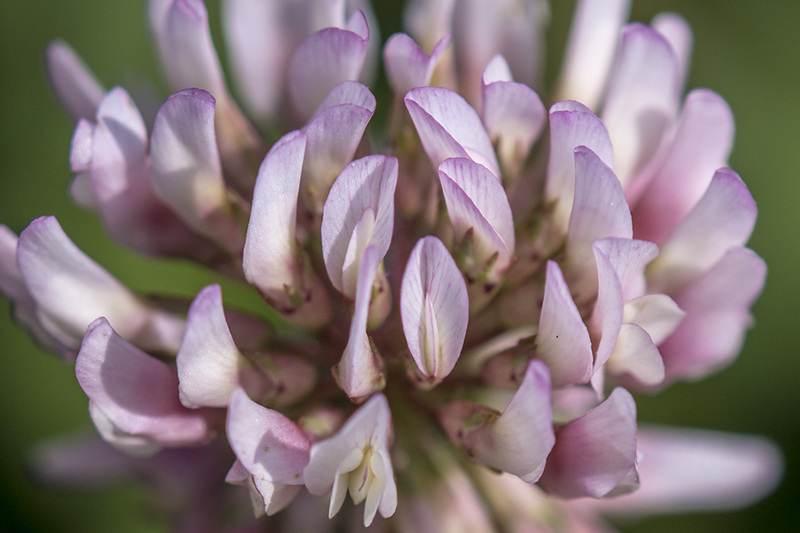 Red clover (Trifolium pratense) stems are hairy. The leaflets have a pale V-shaped marking on the upper surface. The petals are pink or magenta. The individual flowers are stalkless. 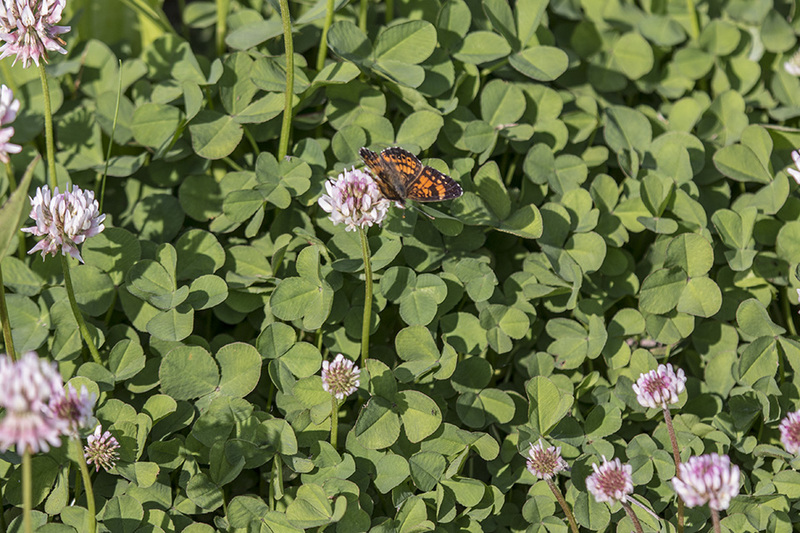 White clover (Trifolium repens) is a much smaller plant, 4″ to 10″ tall. The stems are creeping, not ascending, and they root at the nodes. Flowers and leaves are borne on separate stalks. The leaflets have have a pale, crescent-shaped marking on the upper surface and may be notched at the tip. The flower heads are more white. This is a true species and not a hybrid, as the latin name implies. Introduced perennial herb, stems ascending, usually much less than 0.5 m tall, leaflets serrate at least distally, terminal leaflet sessile like the lateral leaflets (which is true of all Trifolium species), flowering peduncles about 15-25 mm long, pod 1-few-seeded, inconspicuous and concealed by the calyx, fruiting head retains the faded dry petals (which is true of all Trifolium species), common in mountain big sagebrush steppe where well grazed and roadsides in open montane understory. 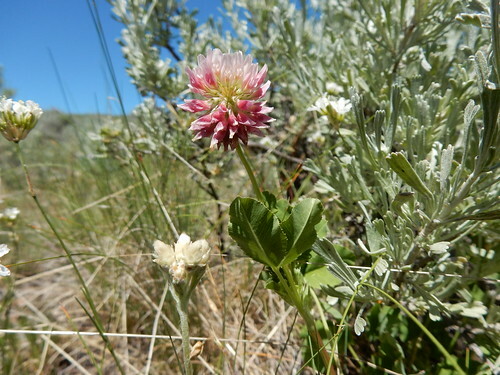 Similar to Trifolium repens, which usually has whitish petals and flowering heads that arise from axils of prostrate stems. 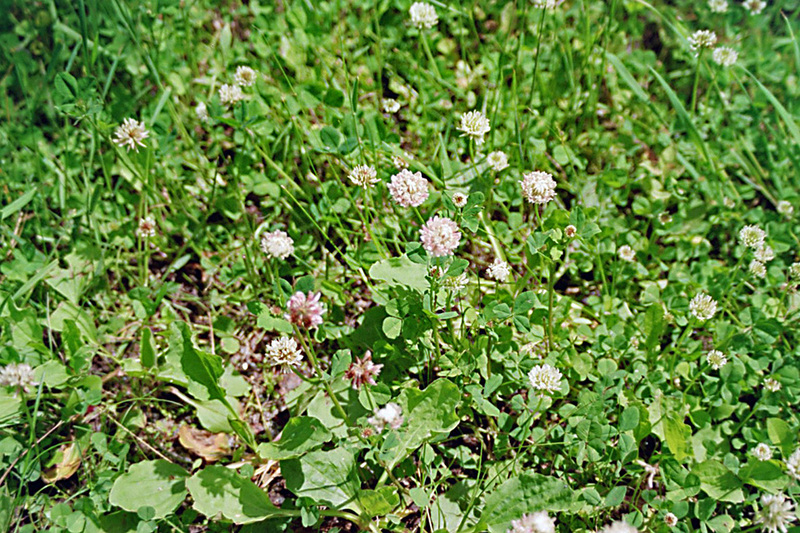 Knowing the difference between difference types of clovers could save your horse's life. 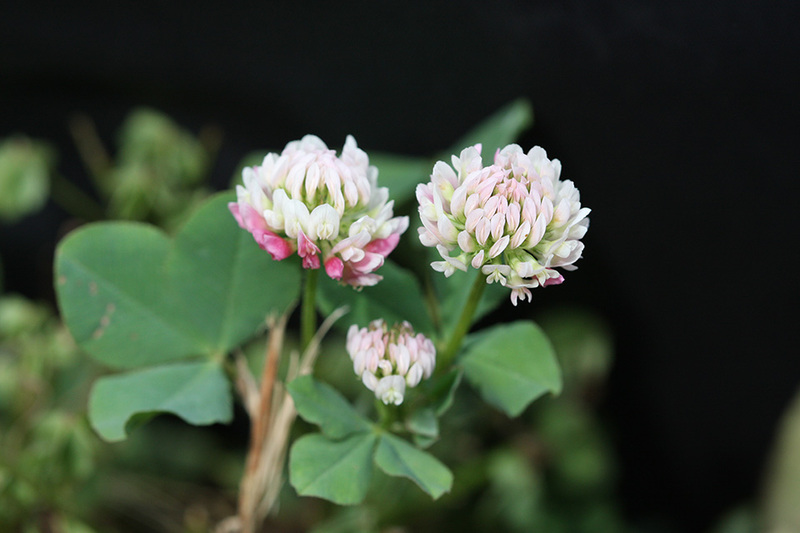 Learn how to identify white, red and alsike clover.